BAPTISTS IN EARLY NORTH AMERICA--MEHERRIN, VIRGINIA features the transcription of the records of Meherrin, an eighteenth- and early nineteenth-century Baptist church on the frontier of Virginia in rural Lunenburg County. Despite its backwater location and relatively small congregation, Meherrin played a significant role in one of the great episodes of Baptist history in young America: the rise of Separate Baptists and their influence in Virginia. Numerous important Separate Baptists including Samuel Harris, Jeremiah Walker, Elijah Baker, John Weatherford (all imprisoned for their faith), and John Williams (scribe of the Separates) figured in the Meherrin story. Meherrin was a microcosm of Virginia Baptist life including evangelism, theological divisions, church discipline, the struggle for religious liberty in the time of a state church, and the role of enslaved Africans. Meherrin was a mother church for several churches in Southside Virginia and a colony from Meherrin even migrated into North Carolina where another church, also named Meherrin, was established. The original record book (1771–1844) is among the treasures in the library of the Virginia Baptist Historical Society. 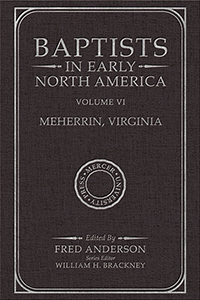 In addition, the volume includes an essay on Meherrin’s place within the larger Virginia Baptist story by editor Fred Anderson, who served as executive director of the VBHS for thirty-eight years. Meherrin became extinct in 1844 when it divided, then dissolved, in the midst of the Campbellism controversy.